On Thursday and Friday I have been at the Great North Museum: Hancock in Newcastle-upon-Tyne to take part in ‘Cultures of Health and Wellbeing’ – the first national conference organised by the new Culture, Health and Wellbeing Alliance. The Culture, Health and Wellbeing Alliance is the national organisation representing everyone who believes that cultural engagement and participation can transform our health and wellbeing. It has more than 3,700 individual members and Voluntary Arts is one of 70 organisations who have become Strategic Alliance Members. The opening keynote presentation at the conference was by Errol Francis, Chief Executive of Culture&, who discussed definitions of ‘culture’ and the difference between ‘culture’ and ‘creativity’. I then attended a breakout session on Democratising Our Practice, in the nearby Northern Stage Theatre, which featured a presentation on shifting power, drawing on the experience of Bait – the South East Northumberland Creative People and Places consortium. The keynote presentation on the second day of the conference was by Lord Howarth, Co-Chair of the All Party Parliamentary Group on Arts & Health and President of the Culture, Health and Wellbeing Alliance. Lord Howarth summarised progress on the recommendations in the APPG’s ‘Creative Health’ report, that was published in June 2017: https://www.artshealthandwellbeing.org.uk/appg-inquiry/ Lord Howarth said he was optimistic that Arts Council England will identify health and wellbeing as a key element of its new 10-year strategy. He spoke about Health Secretary Matt Hancock’s speech to the King’s Fund in November 2018 as a landmark moment. The Secretary of State had said he wants the NHS to move from patient-centred care to person-centred care. He had emphasised the importance of personal creativity and said he saw social prescribing as central to prevention, and prevention as central to the NHS. Lord Howarth said we need to do all we can to ensure this is not a flash in the pan and that social prescribing is firmly established and embedded in the overall culture across government and across health providers. He said it will not be edicts from on high but a change of culture that will make the difference and it will be the health and social care professionals who will ultimately determine whether this opportunity is taken. Alan Howarth also spoke about the need for a Creative Health Centre, led by the sector, to take on responsibility for driving progress. He said “we are at a tipping point for arts, culture and health” and noted a “growing realisation that to pathologise unhappiness doesn’t work”. Fiona Hackney from Falmouth University said that 750 flowers had been made as part of the project and the activity seemed to have proved very meaningful for people from all parts of the UK. 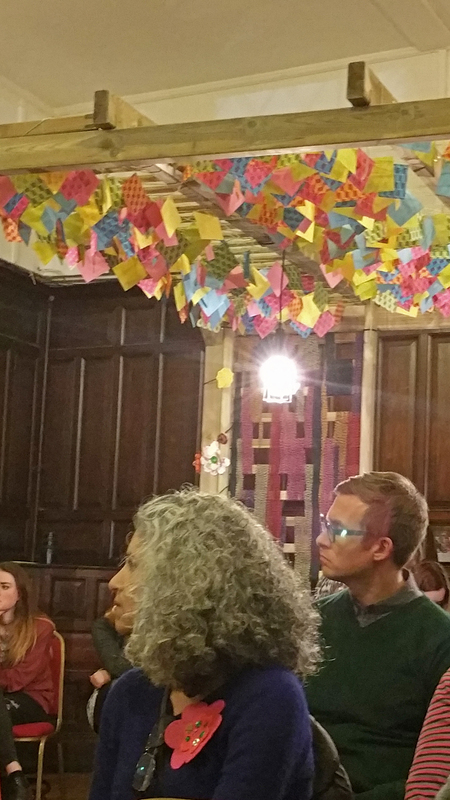 40 volunteer facilitators had run #wellMAKING groups to “craft, connect, reflect, challenge and grow”, realising the value of making together. The project had encouraged “quiet activism”. 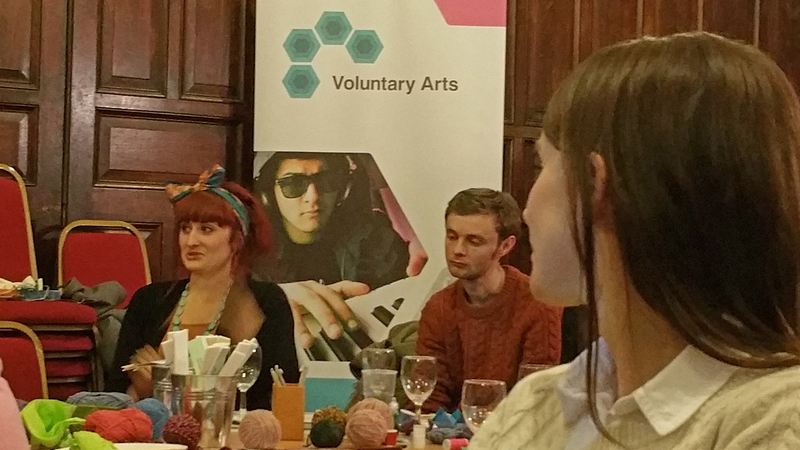 Daniel described how our Hand on Crafts project had demonstrated profound wellbeing benefits for those taking part and encouraged everyone to get involved in Craftbomb and Woollen Woods as part of Voluntary Arts Week 2015 (see: http://www.voluntaryartsweek.org). Jayne Howard, Director of Arts for Health Cornwall & Isles of Scilly said something different happens when people engage in crafts. This is an under-researched area. She spoke about a programme of work with GP surgeries which had showed that crafts practice seemed to help participants bond more quickly. It generated talk, the pace was quite gentle, there were periods of silence but they never felt uncomfortable. The activity provided an opportunity to demonstrate achievement and produced something tangible to take home or give as a gift. Sarah Desmarais, AHRC Research Fellow at Falmouth University, had acted as a participant observer in two groups. She reported that the activities had allowed participants to safely access social companionship. She spoke abut the power of playfulness to give a creative state of mind. Playfulness can be relearned and craft can be very useful in this. Participants become progressively more confident. 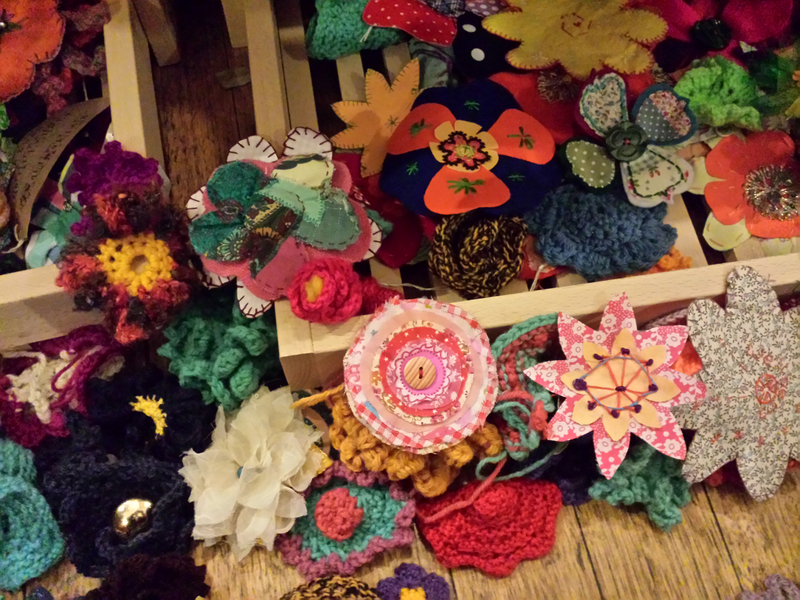 Sarah said crafting helps with all three aspects of wellbeing. She said “craft slows me down and makes me think”. 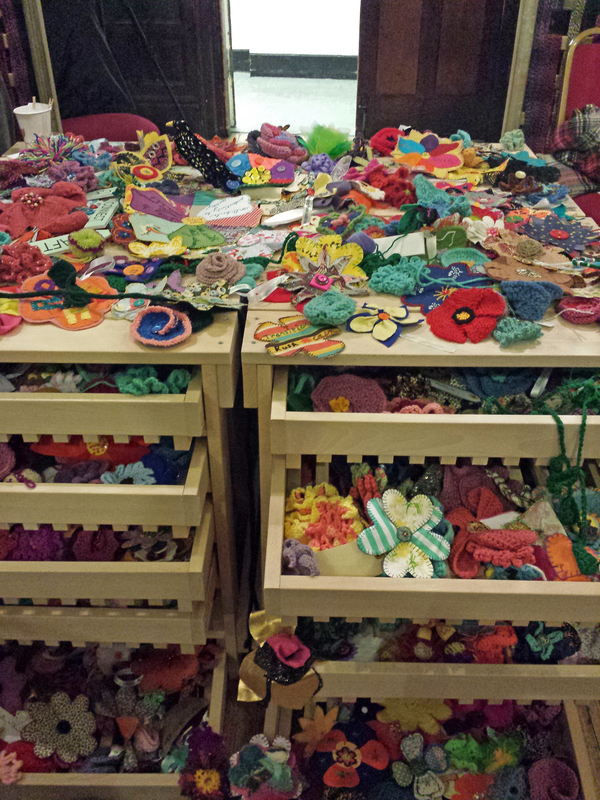 The #wellMAKING Craftivists Garden was a fascinating event. It was wonderful to hear about the experiences of participants, brilliant to see the flowers displayed and lovely to be at an event at which many of the audience were actually stitching and knitting throughout the speeches. On Wednesday evening I was at the Houses of Parliament in Westminster to attend a meeting of the All Party Parliamentary Group on Wellbeing Economics. This session focussed on Culture and Wellbeing with guest speakers from the museums and theatre sectors, the London School of Economics, the Heritage Lottery Fund and Arts Council England. Alan Davey, Chief Executive of Arts Council England, described the work ACE is doing to develop a holistic case for investment in culture. He said they are looking at the immediate effects of cultural activity on individual citizens, the economic effects and the social effects, including wellbeing. Alan said he thought culture does have a part to play in wellbeing and this could lever in funding from other sources but he was less convinced about using wellbeing measures to help to decide the destination of cultural funding which he stressed was a complex process. The final speaker was Dr David O’Brien from City University London (who sits on the AHRC Cultural Value Project Steering Group with me). He noted the wide range of uses of the term ‘wellbeing’ by the previous speakers. He suggested that wellbeing has an ‘apple pie quality’ – no-one wants to decrease it. We need to be careful about the definition of wellbeing. David suggested that being healthy and being employed are the key drivers of wellbeing and everything else is peripheral. He wondered whether having wellbeing as a policy agenda would merely result in the improved wellbeing of people who already have high wellbeing. The Chair of the All Party Parliamentary Group on Wellbeing Economics, former Arts Minister David Lammy, then invited the Shadow Culture Minister, Helen Goodman, and another former Arts Minister, Lord Howarth, to comment on the speakers. Helen Goodman said she understood that health and employment are the really big factors, but those things are intractable and difficult so she asked whether there are any quick wins from culture on wellbeing. Alan Howarth said he was hugely enthusiastic about the elevation of the concept of national wellbeing as a policy goal. He thought it was a statement of resounding banality that the arts promote well-being – of course they do – but it is hard to ascribe monetary values to emotional states. Lord Howarth thought the new Health and Wellbeing Boards ought to present an opportunity for the cultural sector as they would have significant funding. On Wednesday I was at the Royal Brompton Hospital in London for a meeting organised by the National Alliance for Arts, Health and Wellbeing. The Alliance is made up of 9 regional arts and health associations across England, including the London Arts and Health Forum which provides the secretariat. The main focus of the Alliance is advocacy, influencing policy makers in relation to arts, health and wellbeing. The Alliance was established to be: an observatory for the sector; a research hub; a coherent voice for the sector; and to raise standards in arts, health and wellbeing practice. Wednesday’s meeting was a small gathering of national organisations involved, in various ways, with arts, health and wellbeing. Because of the regional structure of the Alliance it has not always been easy for organisations working nationally to engage with it. We agreed to try to establish a regular, informal forum for national organisations to feed into the strategic development of the Alliance. The Alliance has been developing an All Party Parliamentary Group for Arts, Health and Wellbeing which will hold its first meeting in January 2014. The Alliance is also developing a relationship with the UK Arts and Health Research Network, funded by AHRC, which comprises about 35 researchers. The London Arts and Health Forum runs Creativity and Wellbeing Week in June each year: from June 2014 there will also be events in other parts of the country. The 2014 Creativity and Wellbeing Week is from 4-11 June.